Patients undergoing conventional chemotherapy for certain cancers could potentially receive more effective and less toxic drug treatment. 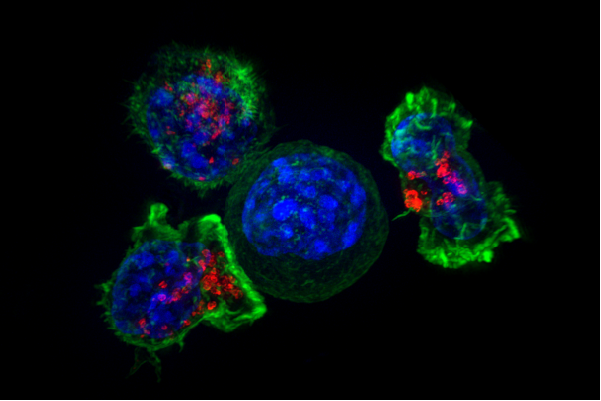 In a July issue of the journal Proceedings of the National Academy of Sciences (PNAS), Dong Zhang Ph.D., associate professor of Biomedical Sciences at New York Institute of Technology College of Osteopathic Medicine (NYITCOM) and a team of researchers detail findings that suggest new synthetic lethal interactions could inhibit the growth of tumors in mesenchymal cells, cells that develop into connective tissue such as those found in bones, soft tissues, and the central nervous system. Chemotherapy, known to injure healthy cells and cause unpleasant side effects such as hair loss and vomiting, is currently the only available treatment for persistent cancers known as alternative lengthening telomere (ALT) cancers. In healthy stem cell reproduction, the enzyme telomerase prevents the shortening of linear DNA ends (known as telomeres) with each replication. The enzyme can also be re-activated to promote genetic stability and immortality in many cancer cells. While many cancers that reproduce via telomerase re-activation may be treated with therapies other than chemotherapy, ALT cancer cells lack telomerase and few treatment options have been developed to inhibit their proliferation. Although ALT cancer cells account for only an estimated ten to fifteen percent of cancer cases, these incidences include some of the most deadly cancers, for example glioblastoma. The researchers sought to better understand what conditions could inhibit the growth of ALT cancers, in the pursuit of uncovering potential new treatments. To do this they investigated three human genes associated with cancer development: FANCM (mutations of which are associated with blood cancers), BRCA1 (mutations of which are commonly found in patients with breast and ovarian cancers), and BLM (mutations of which cause a variety of cancers). FANCM, known to repair DNA damage where two DNA strands have been incorrectly linked, was removed from cells also deficient of BRCA1 or BLM. As a result, the team found that simultaneous inactivation of BLM and FANCM or of BRCA1 and FANCM resulted in dramatic increases of unrepaired DNA damages, preventing the cancerous cells from further reproducing. These findings suggest that if drugs are developed to simultaneously inhibit BLM and FANCM, or BRCA1 and FANCM, they should kill the ALT cancers without posing the same toxic effects as the conventional chemotherapy drugs. "In creating a more stressful replication environment at the site of ALT telomeres, cellular reproduction was halted, leading us to believe that there could be great potential for these novel synthetic lethal therapeutic strategies. Therefore, we recommend further exploring this possibility to target ALT cancers," said Zhang.